The Canadian elections are on par with the world trend – whoever is in office, throw the bums out. The election took place on Monday, October 19, the anniversary of the 1987 stock market crash. The Liberals in Canada toppled the Conservatives as many Canadians saw their Head of State, Mr. Harper, as a dictatorial heavy-handed politician following in the footsteps of the U.S. NSA. The Conservatives were reduced to 99 seats from 159 in the last Parliament, according to preliminary results, and Harper conceded a demoralizing defeat. 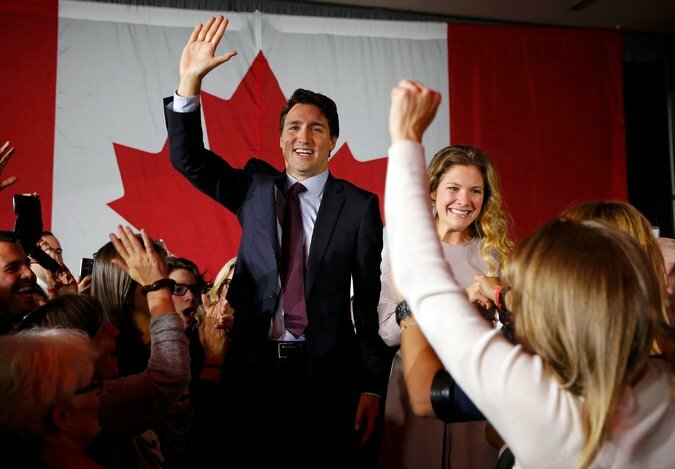 Justin Trudeau will be 44 on Christmas day and will become Canada’s second youngest prime minister in history, showing there is indeed a generational shift taking place in politics on a global scale. He is pledging change with the slogan “Sunny ways my friends. Sunny ways.” However, there are those who will remember his name because Trudeau’s father, Pierre Elliott Trudeau, was catapulted to power 47 years ago. Trudeau captured 184 of the 338 seats in the next House of Commons when, to have a majority, one needed 170. The polls were showing a Liberal lead, but it was marginal. The results at the end of the day were rather conclusion. We should expect the same to emerge in the United States come 2016. We are heading into this period of civil unrest that began in 2014; this trend will manifest in politics as many are upset and separatist movements are growing. The election really became an East vs. West confrontation. The Western region of Canada tends to be more conservative than the East, and Harper was seen as a Western Conservative who only focused on their concerns. Harper’s hometown is Calgary. There was a scandal over the Conservative senator’s expenses for anti-terrorism measures that made Harper look like a stooge of the U.S. NSA. He even attempted to ban the wearing of face veils, known as niqabs, during citizenship ceremonies. Harper even committed the Royal Canadian Air Force fighters to the multinational campaign against the Islamic State. Harper pushed for Canada to adopt the same U.S. law that they can throw anyone in prison without lawyers or a trial, which was championed by Lindsey Graham in the USA. Then there was the growing pension crisis, the economic collapse following commodities with nosediving oil prices, and let us not forget Harper’s handling of refugees and the Trans-Pacific Partnership trade pact. 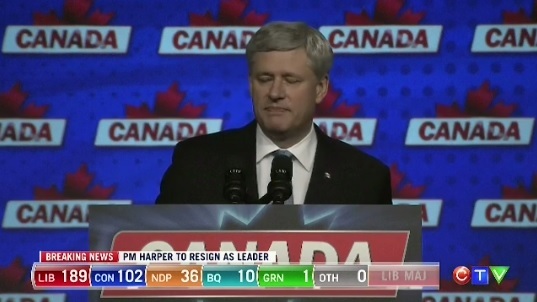 This pretty much sums up why Harper’s support simply collapsed. It would be nice to see the same thing in the USA for those nut jobs who follow the same path. All of this fused with Harper’s control of even the election process. He spent most of the campaign delivering standard speeches to invitation-only crowds to maintain the image that all was well. 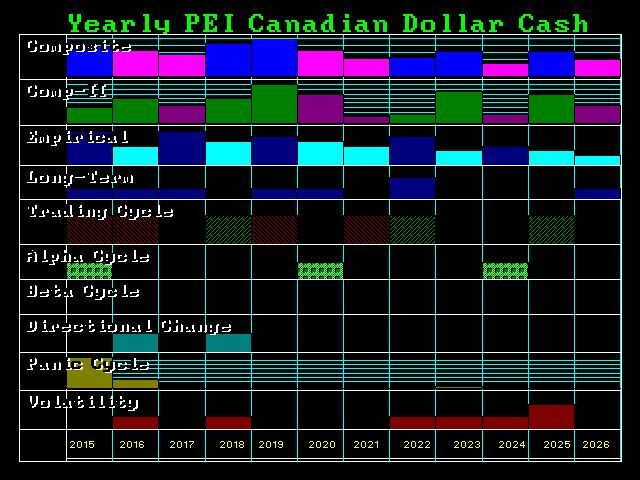 Looking at the stats on the Canadian election, we can see our model was correct in forecasting a rising percentage of people participating in the election. 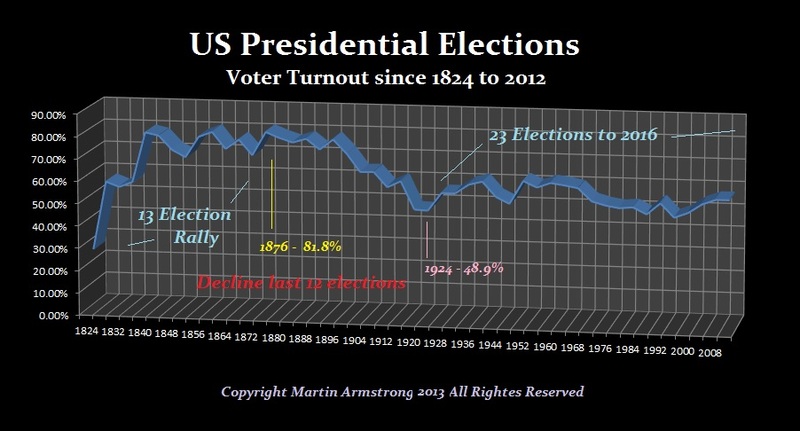 Our model has been projecting that same trend for the USA come 2016. More and more people will come out to vote because of the declining economic conditions in the U.S. In Canada, the turnout fell to as low as 58.8% during the 2008 election and was in an uptrend reaching 61.1% in the last parliamentary elections during 2011. This election has shown a huge jump: 68.5% of the country’s 25.6 million eligible voters participated in this election. Once again, we are showing this trend on a global scale. As the economy turns down in the USA, this will be the last nation to join the global recession that began in 2007. Stephen Harper’ policy and performance has been so off-the-wall goose-stepping with Obama, he had little choice but resign as conservative leader as he asked his party’s national council to reach out to the new parliamentary caucus to appoint an interim leader and implement a leadership contest. He was so off the mark with respect to the trend globally, it is hard to imagine how disconnected he was from reality. The sunny days, unfortunately, will not appear. Canada is part of the global community and it cannot turn its economy up when the world is pointing down. 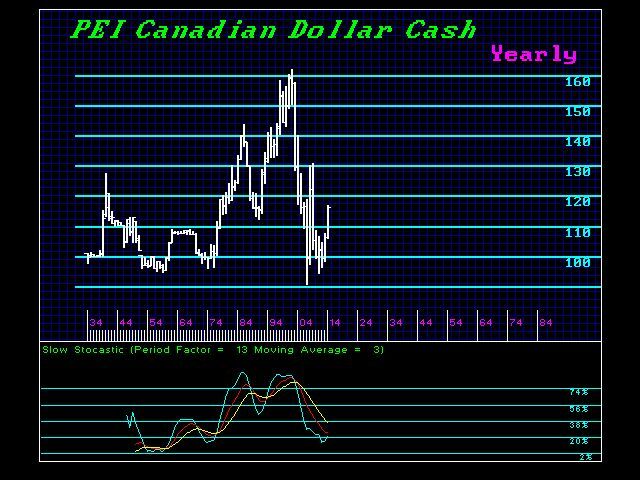 When we look at both the futures and the cash on the Canadian dollar, it does appear that there will be a shift in trend next year more likely than not with the Commodity Cycle.